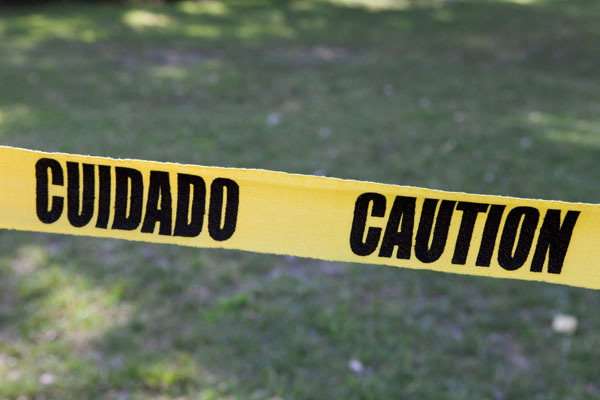 Frances Trombly’s Caution consists of 250 linear feet of hand-dyed, hand-woven fabric on which the artist has embroidered the text “caution / cuidado” to resemble actual caution tape. The artist often uses trompe l’oeil effects in her work to recreate mundane objects, making labor-intensive pieces through weaving, embroidery, cross-stitch and crochet. Her work questions the value of labor, and addresses issues of feminism, class and the American way of life. For her installation at Socrates, Trombly uses the meticulously crafted recreation for the same functional purpose as actual caution tape; as a barrier and a visual warning defining an otherwise undifferentiated space within the Park. The artist expects the piece to evolve over time and anticipates that audience interaction as well as the weather will cause the fabric to deteriorate just as real tape would. Frances Trombly was born in Miami, FL, where she currently lives and works. She has exhibited in major U.S. cities including New York, Miami, and Los Angeles, as well as internationally including London, Vienna, and Latin America. Funding for Open Space projects has been provided by Lily Auchincloss Foundation, Carnegie Corporation of New York, Charina Endowment Fund, Mark di Suvero, Linford Lloyd Lougheed, Thomas Smith Foundation, and Starry Night Fund of Tides Foundation.